This dialog is called from the Note menu. It allows you to split a large text file into several smaller text notes and to specify both where Tinderbox should make the divisions and how the notes should be titled. Delimiter. Break on a delimiter. A box for entering the delimiter and the delete delimiter tick-box are hidden when this option is not selected. Custom delimiter string - see below. Title. This controls what text is placed into the title of each newly split note. Text is still truncated with an ellipsis if greater than c.512 characters (in older version pre-v5 it was c.64 characters). Within this overall limit, the title can based on sentences or paragraphs in the exploded note's $Text. A 'sentence' is delimited by a terminating period, exclamation mark or question mark. A paragraph is delimited by a line return (line break). Omit text. This results in only a $Name being set for new notes and no $Text. Action. Allows a simple action to be inserted that is applied to each newly exploded note by setting an $OnAdd for the 'exploded notes' container created by the process. It is useful for tasks like applying a prototype to all new exploded notes. Example. Gives a preview of the $Text of the first exploded note. 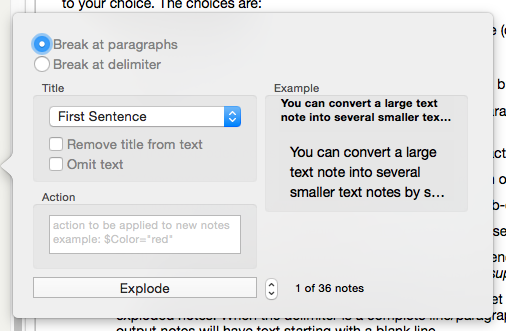 A control below the preview allows cycling through a preview of successive exploded notes. Explode button. Click to start the Explode process using the choices set above. The Return key will also start the Explode process (from v7.5.0). See Exploding Notes for more detail of the overall process and options available.